When you’re on a long road trip, your car feels a lot like your house… If it’s a crap-hole filled with garbage and clutter, you’re going to feel the same stress you feel at home when the coffee table looks like something from Animal House. For this reason, road trippers have been putting small trash cans in their cars for years, but that has its own set of problems… First, they just love to fall over. Second, if you’ve ever thrown away something perishable and left your car while you explored Arizona on a summer day, you know this little trash can hack can quickly give your car that new-garbage-dump smell. The perfect solution? Put a plastic grocery bag or small trash bag in one of those niffty plastic cereal containers. When you’re leaving the car in the heat, simply close the lid until you’re ready to empty the trash. Where has this idea been all our lives? 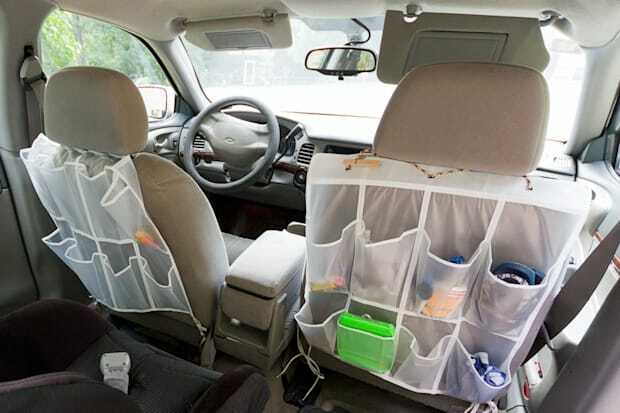 We hate, hate eating while actually on the road, and we wholeheartedly think you should be enjoying meals at little diners along your trip, but this will help when you’re in a rush… Sit the shower caddy on the center console and enjoy your fries, sandwich, etc. without having to fumble around. Plus, who likes to eat just the sandwich then the fries? This way, you can go from one to the other. Bonus points if anyone can give us a good tip for putting ketchup in this caddy. Probably not a necessity for solo road tripper, but if you have a family, this may be just the ticket. Instead of fumbling around your bags for toys, wet wipes, etc., just take a shoe organizer and throw it around the headrest. You can easily grab everything you need from the front seats. Ugh, we learned this the hard way. You know the road trip routine… Drive, explore, enjoy, and then check in at the hotel or set up camp. Then you drag your entire big dumb suitcase or duffle bag and scatter days worth of clean and dirty clothes across your room or tent. We don’t care how good a job you did packing that bag, by day 2 everything is wrinkled so badly your mother wouldn’t speak to you if she knew. The solution? Ditch the travel luggage for containers you can store in the back of the SUV/van or the trunk of the car. How you organize the containers is up to you, but we like to keep a “go bag” with everything we know we need each night/morning along with any valuables in a backpack and then have containers set up with shirts, shorts/pants, underwear and socks, and then dirty clothes. While if you’re starting from and returning to your home you can use nice plastic containers, we know many of you fly somewhere then drive, just like we do. Either stop by a store and grab some bankers boxes (lid is a bonus for the dirty clothes) or ask a store or your hotel if they have some boxes you can grab. (Tip: ALDI grocery stores sell pretty much everything from boxes so their cup often runeth over.) Worse comes to worse? Even some paper or cloth grocery sacks will do the trick. The most talked about hack for a makeshift smartphone holder is a binder clip, but they just don’t seem to hold the phone very securely. Snake a rubber band through your vent to band your phone to one of your air vents. Tuck a couple dryer sheets around the car to keep your stench from becoming unbearable. Trust us, this also helps in your son’s college dorm room. A no-brainer if you’ve got a group of folks with you all wanting to watch movies, use their laptops, etc. Also handy for a solo traveler to keep a laptop charged in case you need to clear out a camera card or write the next great American novel from the middle of nowhere. Well, there you go, fellow road trippers. We hope this post of road trip hacks (which is full of ideas passed around the internet by everyone known to man) is at least a little more in-depth and convincing for why you should implement a few of these hacks. See you on the road. When it comes to preparing and packing for the trip, click to check out this handy-dandy checklist our friends made for us. 50 states in 7 days… Can these maniacs do it?